You may have seen mention of the Rally 4 Kids in last week’s Montecito Miscellany – and several times in my columns. The event supporting the United Boys & Girls Clubs of Santa Barbara County was run for the second time, this year with modifications to leave the results less to chance. The organizers, including Diana Starr Langley and Monte Wilson, invited me to participate, and I was accompanied by my lovely navigator and girlfriend, Liz Baker. The initial plan was to pilot my Porsche Speedster replica, but for the sake of comfort – we would be on the road for close to five hours – we chose my 2002 911 coupe. The route began from Summerland software outfit QAD, which offered an excellent starting point, not only for the location, but also for the views. A brief peek inside the building displayed impressive vistas overlooking the hills and made me want to take up a career in software development. After a brief photo-op, we set off along the back roads toward Carpinteria, where we hit our first stop, the local Boys & Girls Club. We were given a chance to hit six free throws in the gym, where our combined skill resulted in precisely one made shot, though that wasn’t far below the average. Along the way we were answering trivia questions, and one of the first involved a racetrack that used to be nearby. It turns out the Carp Thunderbowl was a dirt track whose fate was sealed by the Highway 101 expansion project. The freeway didn’t actually go through the track’s property. Rather, as it passed nearby, the Thunderbowl was used as a depository for all the excavation dirt. We next gathered at the Ojai Valley Museum, where we got to some trivia and learned that the original name of the town was actually Nordhoff. From there, we ran down to Oxnard, with a stop at the Painted Cabernet. We were told to snap a pic of our car before going in, so you can imagine what we’d be painting. The results were predictably varied, with efforts that ranged from kindergarten finger-painting to MOMA-worthy. Luckily, Liz’s art-major background saved our effort from falling into the former category, and our collaboration will no doubt be lauded in the motoring art world for years to come. Also in Oxnard, we dropped by a Go-Kart track run by Jim Hall Kart Racing School – Jim was a rally participant as well. We got a chance to post the fastest lap time, a competition in which I placed seventh overall. I’m fairly competitive, but I had little cause to argue that I had a slow kart, since I jumped into it right after David Green jumped out, having set the pole for the day. Our final driving stint was toward Malibu along the PCH, and then up Mulholland Drive. Again, this famous road offered some incredible opportunities for spirited driving, with a full dose of exhilaration priming us for lunch at the Calamigos Ranch. We gathered at the Malibu Café, an open-air venue that feels almost like a mini-amusement park, a great place for families to gather. We took our time having some cocktails and listening to the band before heading back down toward the PCH for the ride home. The afternoon was a nice leisurely amble, since we just needed to end up at the Nesbitt Estate by the late afternoon to line up our cars at the event-ending gala. We managed to get through the day of driving with just one instance of raised voices, a pretty good result for an affair such as this. At the gala, there were live and silent auction items, as well as the typical paddle raise, run by Boys & Girls Clubs of America board member Jeff Henley. He challenged participants, if they had any doubt about the value of their donations, to head to a club location and see for themselves where their money goes. So, I decided to take him up on this. This past week, I went to visit United Boys & Girls Clubs CEO Michael Baker at the Westside Santa Barbara location. This is the area of town where he says the need is greatest for the services that his clubs provide. Naturally, Santa Barbara is an expensive place to live, and many of the low-income families in town, especially in this neighborhood, share houses with other families. There can be as many as three or four families in one house, he says, but though some families are dealing with adult challenges that life has put in their way, he asks, “What does that have to do with a 6-year-old?” Kids, in his opinion, should always have access to the safe surroundings of a place like the Boys & Girls Club. Because there are many families near the poverty line in this area, Baker says that 97 percent of the kids here are on the subsidized school lunch program. The clubs supplement that assistance with dinners, and they serve around 200 meals per night, a program underwritten by the Santa Barbara School District. When I visited, there were kids playing soccer in the gym, and pool and foosball in the game room. We went upstairs to the room dedicated for younger kids, where they were learning some hip-hop dance from a local volunteer. We saw the art studio where kids were practicing their yarn work, and then we went into the Musicbox. Amazingly, the club is equipped with its own fully functional recording studio, courtesy of nonprofit Notes for Notes, which operates in clubs here and in L.A. and Nashville. “The days of the school music program are gone,” says Baker, noting that La Cumbre Junior High has been bringing students to the Musicbox to replace some of the programs that used to be on offer. Baker and I talked about his goals for the club, particularly the ability to be open for more hours. They’re currently open from 2 to 6 pm during weekdays, and they do have Saturday hours as well. He’d like to be able to extend that to 8 pm, and also to be open all week. His leadership at the clubs here has tried to focus the staff on being “relentless in finding kids that need our services,” he says. He also wants to make sure that the staff of the clubs is familiar with all of the agencies in town to be able to help connect families in need. My visit to the club impressed with the scope of their programs and the level of participation. It’s been great to be involved with the rally, and now that I’ve seen the organization in action, that sentiment was reinforced. The event itself was certainly worthy of the money that was raised, with drivers and navigators having a blast. Chris Eberz and Lark Cobb, a charmingly enthusiastic couple who are regulars at Cars & Coffee, were declared the winners, and they had nothing but glowing praise for the event, particularly the format that included a great mixture of skills and trivia, along with the driving. “It was one of the funnest days I’ve actually had rallying,” says Eberz, and given his extensive rally experience, who could argue with that? An email just hit my inbox, detailing a 1966 Ford Mustang for sale locally. It shows its age through some cosmetic issues and has a few other shortcomings, such as its six-cylinder engine, worn-out front seats and – in the eyes of some – its padded black roof. But this would be an opportunity to own a cool classic car that would prompt thumbs-up from bystanders. The price of entry: $7,000. The timing is serendipitous, since it helps to illustrate the point of this column, which I’d already been working on. While “car people” may have a decent idea of the value of classic cars, the views of the population at large are skewed, generally in one specif- ic direction. The uninitiated tend to believe that the cost of entry into the classic car market sits much higher than reality. To get some hard data on the topic, I turned to Survey Monkey to craft a questionnaire that would quantify this phenomenon. I showed pictures of four different classic cars and asked what each person would expect to pay for each. To keep it simple, I only specified that the cars were in “good” condition. I then found the value for a Condition number 3 vehicle (“good”) at the Hagerty Insurance online valuation tool (www.hagerty. com/valuationtools). The difference in percentage terms was what I’ll call the overvaluation. I’ll admit to stacking the deck a bit in my favor. I mostly chose cars that I expected people to overestimate because of their looks or names, but which happen to be worth less due to their ubiquity or other factors. I also selected the base models of these vehicles, or at least the cheapest model I could find on Hagerty. 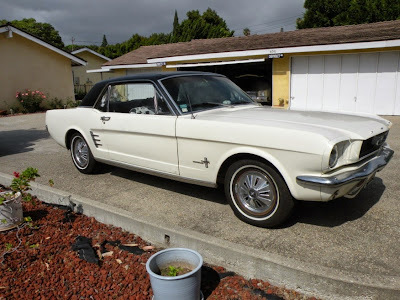 Incidentally, one cannot find a value for a six-cylinder ‘Stang from 1966 on that site, since I suppose it’s not considered “collectible.” But take that thing for a cruise down State or Cabrillo, and you’d still feel like a million bucks. For a sample, I selected 12 of my friends who are decidedly not “car people.” They see me driving nice cars and they think they’re cool, but these people’s lives are consumed by many other things, cars not being high on the list. While the deck was a bit stacked against them, I had no idea how skewed their perceptions would be. Let’s take a look at these cars one by one, ordered by how overvalued they were. The first was a 1974 VW Beetle. By this point in time, the Beetle looked less classic and a bit more pedestrian, due to items like the headlights, fender lights, chunkier bumpers, and curved windshield, and the interiors suffered similarly from safety regs, but they still retained the essence of the original. While Hagerty puts a ‘74 sedan at around $7,600, the group thought they’d have to pay around $14,200 on average, with guesses as high as $50,000. That’s an 87-percent overestimation. My friend Annie Huang had such a guess and gave some insight into her thought process. Rose Knapp agreed: “I tend to associate anything classic/vintage/antique as something that gains in value as it gets older.” It’s an interesting thought, and it got me thinking about the fallacy of antiquity. Things that are old are often worth more, but sometimes you can get a bit detached from the starting point. 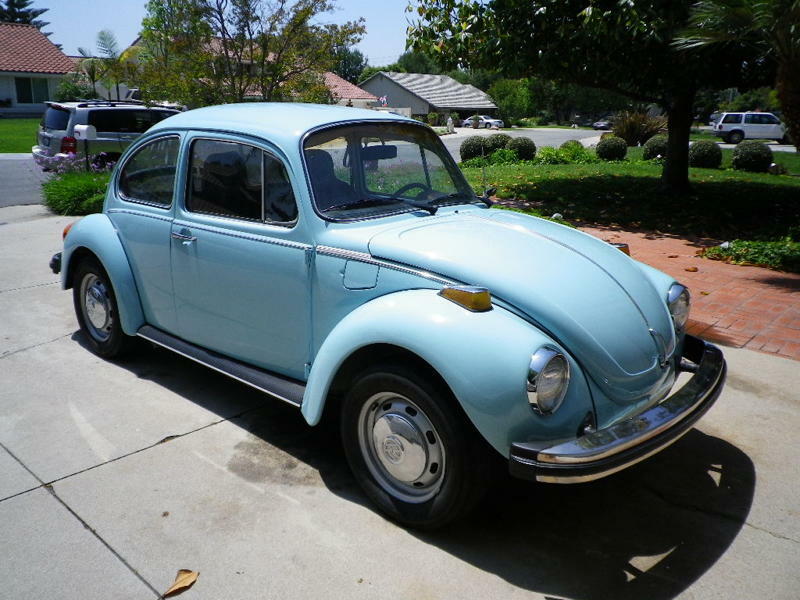 The ‘74 Beetle started at $2,630, which is only about $12,500 in 2015 dollars. While from the perspective of someone who grew up in the ‘90s there aren’t many around, VW was still selling hundreds of thousands per year in the ‘70s, making it no surprise that these cars didn’t keep up with inflation. Fifty years from now, a 2015 Chevy Cruze might be considered pretty cool, since it would be a link with the past, but that doesn’t necessarily mean that it’ll be worth more than a few thousand space-bucks. From there, things get much more extreme. Let’s take a look at the 1966 MGB, a car I actually owned until a few years ago. To me, this car is classically classic, a British Racing Green roadster with a lovely chrome grille and bumpers, wire wheels, fenders that rise beside a low hood to hold out circular headlights, and vertical taillamps. I actually showed a picture of my car in the survey. I took a bath on that car, selling it for $7,650 when the economy was not fully recovered. Hagerty says it’s worth around $11,200, which is a thousand above what I bought it for right before the economy crashed. My friends, on the other hand, figured they’d have to pay more than 35 grand, an overestimate of 218 percent, or more than three times its actual value. This was the car that revealed to me that classic car ownership was affordable. Even with its legendary Lucasite reliability, I only sank about $1,700 into the car over four or five years of ownership. It certainly helped that parts were readily available from outlets like Moss. A side benefit: I also learned how to tinker on a car without fear that it would explode in my face. Next on the list is a 1969 Ford Mustang. The styling morphed a bit from the original, making the car a bit chunkier and less graceful, but the headlights outside the grille remained – unlike the ‘70 model – and it’s still recognizable as a classic Mustang. Hagerty value: $10,500. Layperson estimate: nearly $38,000. Even a good-condition ‘66, the last year of the (mostly) original styling, can be had for just more than 15 Gs. The Mustang is a legendary car, but Ford sold its first million in fewer than 18 months and went on to sell in the hundreds of thousands nearly every year until 2007. The ‘69 was actually the lowest-selling ‘60s model, missing the 300K mark by a mere 176 units. A ‘69 Dodge Charger, on the other hand, which sold in significantly smaller quantities, would cost more than $30,000, even for a base V-8. Mopar fans looking for a deal could pick up a neutered Dodge Challenger from 1974, when the only V-8 made just 150 horsepower, for about $16K. And that brings us to the final car, one so overestimated that you may need a floor jack to pick your jaw up off the cement. For 1976, the Chevy Corvette had recovered some of the power it had lost from its engines during the fuel crisis, but the L48 motor still had only 180 hp. And this was well into the urethane bumper days, when five-mph federal regs had stripped the ‘Vette, like many other cars of the era, of its classic-looking chrome bars. Still, the Corvette wore it well, and a ‘76 model still apparently looks expensive. How expensive? Nearly 50-grand worth, according to the crew. The real value of this car is a shockingly low $8,800. They’d overcalled it by 460 percent. While GM called this car a Stingray, it doesn’t nearly hold the value of the original, two-word Sting Ray models (1963-67), the cheapest of which you can get for around $30,000 in good condition. As some might expect, the men in the group – the survey takers were split evenly, six to six – had more awareness, averaging only 169 percent over versus the women’s 351 percent. It’s a big gap either way. So, who got the closest? Jason Austin, a local farrier (he shoes horses), averaged only eight percent over. He attributed his relative awareness to “many years of looking at Trade Express.” He mentioned that he might have gotten even closer had he seen the “good” stipulation. But the fact is that he still overestimated the value of my MG by 56 percent after seeing a picture of the very car. That car might be considered a “20-footer,” meaning that from that distance it looks pristine. Sure, you could pay a ton more for a concours-quality ride (for a “Condition 1” 1966 MGB Hagerty estimates you’d pay nearly $30K), but then you’d be afraid to drive it or park it anywhere it might get breathed on. The point remains that classic car ownership is still a largely accessible proposition for many people who may not realize it. Clearly, there are other considerations, like time, garage space, and all the other things life might throw at you. But for me, entry into this highly rewarding world only happened when I finally realized it was possible. And now I’m here to spread the word. If you’re interested in a “well-maintained” 1966 Mustang, which spent its life in Santa Barbara, contact Jeff Paley at (805) 687-6173. If you have a story about a special car or piece of car culture in the area, email Randy at rlioz11@gmail.com. Or follow him on Instagram @rlioz. I’ve certainly waxed affectionate on these pages for the strong automotive culture in these parts. Santa Barbara has not only plenty of car people, but also plenty of businesses catering to this crowd. Recently my girlfriend, Liz, and I had the pleasure of enjoying all the elements of the perfect Santa Barbara area car-themed vacation. She’s got some gas in her veins, too, so she was the perfect partner for a vehicular-inspired adventure. Because we live here, we were able to take our time about it and space it out in a leisurely manner. But if you were to string together these activities into a single weekend or mid-week respite, it would make for a nice, full staycation. Let’s start with accommodations, since this definitely involves a for- ward-thinking plan. We’d heard about the Santa Barbara Autocamp, a hotel consisting of five Airstreams, and were excited to try it, but it took some time for them to squeeze us in because of the property’s popularity. If you want a weekend stay that includes a Saturday, you’re probably out of luck for a while. But since you happen to live in the Santa Barbara area, you should take advantage of your flexibility, and grab a night or two mid-week. It’s a totally unique experience that will light up your Instagram profile with likes. We also got a chance to chat with Ryan Miller, VP of Marketing and Innovation at Mesa Lane Partners, the property owner. He gave us a little insight into Autocamp’s past, present, and future. When you first enter the property, you’ll see a sign that proclaims its establishment in 1922. While the hotel has only been around since 2012, the trailer park itself has been there continuously for 93 years. There were some vacancies when Mesa Lane bought it, so the developer’s innovative minds decided to consolidate those and create a novel tourist experience. The Autocamp harkens back to the early age of highway vacationing, even before the Eisenhower system lent newly prosperous Americans the ultimate sense of freedom. The Santa Barbara-Ventura route was actually the first segment of Highway 1, and there were many businesses that popped up in the Midtown area, where the Autocamp resides, to cater to the new set of automotive tourists. In recent years, the zone has experienced a bit of a revival, somewhat anchored by Trader Joe’s. “There’s actually this great business and community culture that’s here,” says Miller, citing the restaurants and coffee joints that make it a “walkable” area. It might have been a bit more difficult for guests there a few years ago, but the new development, plus Autocamp’s provision of beach cruiser bikes for its guests, makes explora- tion of the area a pleasure. We stayed in unit 3, a 26-foot Airstream Overlander from 1959. It contained a comfy full bed on one end, with a convertible bed helping to bookend the central kitchen and bath. It was a charming space that proved more comfortable than expected. We enjoyed the patio with some friends early in the evening, with its Adirondack chairs, though there were only two, so it was good that we brought some camping chairs. It was easy to be lazy and not use the electric grill out there, since there are good eateries nearby. We did sushi at Edomasa, and enjoyed the leisurely pace dictated by its late closing time. By the time we got back, it was a bit too chilly to hang outside, but even with six people we were comfortable inside. Don’t worry about bringing your own wine glasses, since there are plenty inside, which are cool enough that you’ll be glad you can buy them. Some helpful tips: it’s a bit tight inside the bathroom, so the TP roll is hidden inside a cabinet. And if you’re a bit confounded about where to find the light switch in there, check under the counter. Finally, if you flip a switch and nothing happens, wait another second or two, since it might be the very cool LED light strip that makes for some great ambiance inside; there’s a bit of a delay there. You’ll also find a card that entitles you to free mimosas at Our Daily Bread the next morning. We crossed the street to redeem, and while our breakfast was yummy, they didn’t seem to have much interest in following through on those mimosas. After much effort, we finally received them well after our meal was gone. If you’re lucky enough to snag a Saturday night at Autocamp, the best place to continue the auto-themed jaunt the next morning is Santa Barbara Cars and Coffee, in Montecito. We’ll have a deeper look into the event’s history in a later issue, but suffice to say it’s been bringing together the area’s car-crazy since 2010. You’ll see a variety of automotive sculpture, from true antiques like a Model T to highly valuable classic Ferraris with racing pedigree, to modern exotics with goose-bump-inducing exhaust notes. Hit the brakes when you see J’s Tires at De La Guerra, since The Shop still bears this outdated sign. While they’re attached to a service shop, J’s has been gone for years (he still owns the property). It’s a walk-up counter, and on the weekends there will be a line, but it’s worth the wait. We talked to Scott Manser, one of the owners, and he told us about the evolution of the establishment. While it was originally slated to be a coffee joint – Manser definitely gives off a hipster vibe – it morphed into a “foodie hub” with the help of chef John Pettitt. It’s paid off, with our last brunch there focusing on dishes featuring their house-made bread, thick and toasted to a perfect crisp. The Bananas-In-Yo-Face paired it with bananas, local honey, and their own almond butter, coming together to offer a delicious combo that Manser calls a “sleeper” favorite. Manser also talked about future plans for The Shop, which includes a dinner shift – they hope in a couple weeks – and a line of kitchen odds and ends, which could include things like that scrumptious almond butter and “tools for the kitchen,” which are pretty much what you’d think. When you’re done at The Shop, you can hop across the street to Milpas Motors to check out their eclectic line- up of pre-owned metal. While we were there, we spied the typical sort of classics, along with more esoteric pieces, such as ‘80s Toyota Land Cruisers – both kitted out and stock – and a Nissan Nismo Juke. Whether you have a car-crazy relative in town for a visit or you just want to experience all the autodom Santa Barbara has to offer, this trip should give you all the oil-soaked joy you could hope for. Visit autocamp.com/sb to book an Airstream trailer stay. Our thanks to Santa Barbara Autocamp for the complimentary night. Go to sbcarscoffee.com for the Cars and Coffee schedule. Visit The Shop Café at shopcafesb.com. Check out Milpas Motors at milpasmotors.com. If you have a story about a special car or piece of car culture in the local area, email Randy at rlioz11@gmail.com. Or follow him on Instagram @rlioz.